Did you participate in a meme or blog carnival this week? Link up your post here at the end of every week, and get more for your meme! 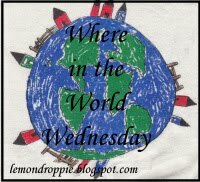 Last Wednesday, I started something new called “Where in the World?” and I hope you’ll join me! I’m writing about the places I’ve been, and I hope you will, too. Then just link up your post, and we’ll travel the world together. (Or maybe we’ll just go out on the town!) Where in the world have you been? Sometimes I’m going to write about my travels, but sometimes I might write about our trip to the neighborhood pool. If you don’t travel, you can still participate! Next Wednesday’s suggested theme is your favorite BEACH. Don’t have a favorite beach? Write about where ever you want to! Janna from The Adventures of Motherhood is also starting a new project! For more information about Janna’s new venture, click on the button above! Visit a few links, and leave substantial comments. You don’t have to write a novel; just write a nice comment that shows you actually read the post. ← Please Don’t Forget the Pie! I like the idea of where in the world. Although I'm pretty much always in the same place these days; especially on Wednesdays! The Recording your Youth project sounds so fun! It is like a gift to yourself to get all those old memories into your computer! I am sad I missed your Where in the World Wednesday! Last week kind of got crazy for me!! I really plan on being there this week!! Where in the World-great idea-I love reading about where people have gone and the places they love-Happy SITS Saturday Sharefest! !